A day after President Obama said the U.S. strategy against Islamic State of Iraq and Syria (ISIS or ISIL) depends on local forces, Defense Secretary Ash Carter acknowledged to the Senate Tuesday that the administration is only supporting 60 moderate fighters in Syria. "This number is much smaller than we'd hoped for at this point, partly because of the vetting standards," Carter admitted to the Senate Armed Services Committee, calling the vetting process "rigorous." "But we know this program is essential," he added. "We need a partner on the ground in Syria to ensure ISIL's lasting defeat. And as training progresses, we're learning more about the opposition groups and building important relationships which increases our ability to attract recruits and provides valuable intelligence for counter-ISIL operations." Along with Carter, Chairman of the Joint Chiefs Martin Dempsey testified before the committee on Tuesday. Committee Chairman John McCain, R-Arizona, slammed the administration's efforts, telling Carter that 60 was "not a very impressive number." He suggested that efforts to recruit more fighters would fall short unless the administration could provide greater assurances that the U.S would protect them from Syrian President Bashar al-Assad. "So you're recruiting people and not telling them that [you're] going to defend them because you haven't made the decision yet, and yet you want to train them quickly and send them in," McCain said with incredulity to Carter. Carter responded that "we an obligation to help them when we equip them," though the U.S. hasn't explicitly said that to the forces. Carter and McCain also sparred over congressional efforts -- or the lack thereof -- to sufficiently fund the Pentagon. The senator asked the defense secretary whether he'd prefer to see the Pentagon subject to sequestration spending cuts or fully funded with the "Overseas Contingency Operations" (OCO) budget, since that money (which some liken to a slush fund) is exempt from the sequester cuts. 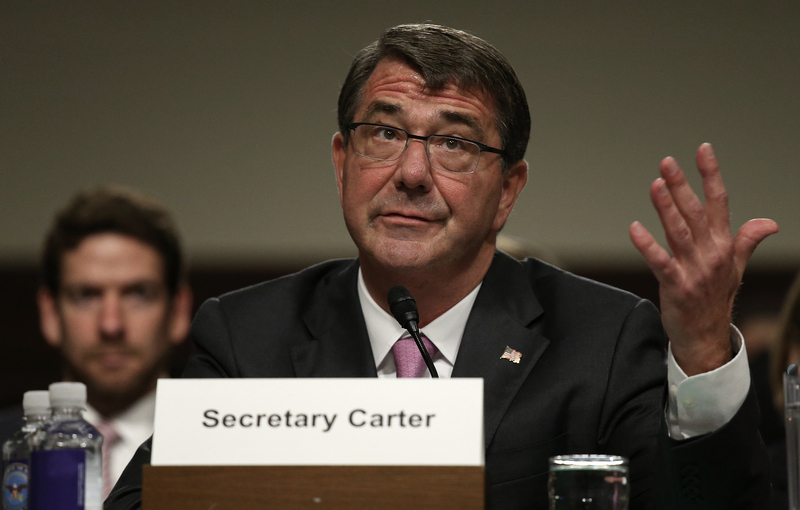 "I'm hoping we can do better than that," Carter responded. "It's embarrassing that we cannot, in successive years now, pull ourselves together before an overall budget approach that allows us to do what we need to do." Sen. Tim Kaine, D-Virginia, agreed that Congress shouldn't rely on OCO funding. He added that Congress should vote on authorizing the fight against ISIS. "What Congress is supposed to do is to provide a budget to you to defend the nation and win this battle, and Congress is supposed to authorize a war that is now 11 months in," he said. "And we've not done either."